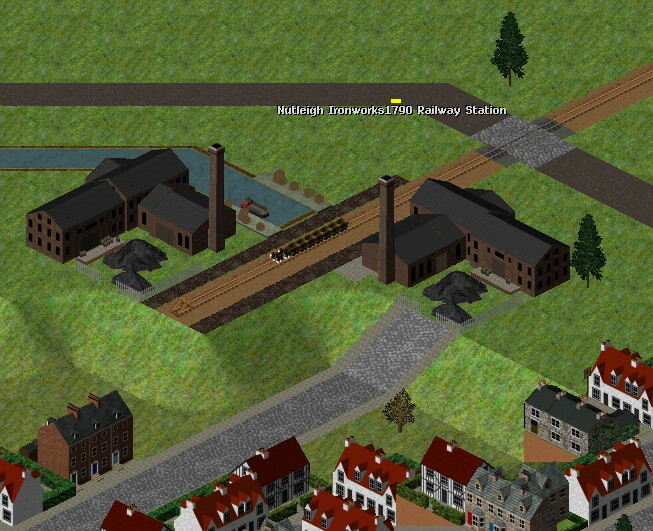 Discussion in the Bridgewater-Brunel online game about industries in the 18th century has revealed that we are lacking early heavy industries, most notably the ironworks. Steel production was rather a later thing, and only made really popular in the 1850s with the invention of the Bessemer process. Before then, ironworks ruled the day. A single industry graphic for an early industrial revolution ironworks could encompass an industry chain taking in coal and iron ore and (or earlier versions perhaps wood and iron ore - charcoal was used in the early days) and put out hardware. The hardware shop could be backdated using the 18th century graphics. My time is limited, so it will be a while before I get around to doing this. I have posted this here partly as a reminder to myself, but mainly to invite others to have a go at an ironworks graphic for Pak128.Britain (it would be useful both for Standard and Experimental) to improve early heavy industry. 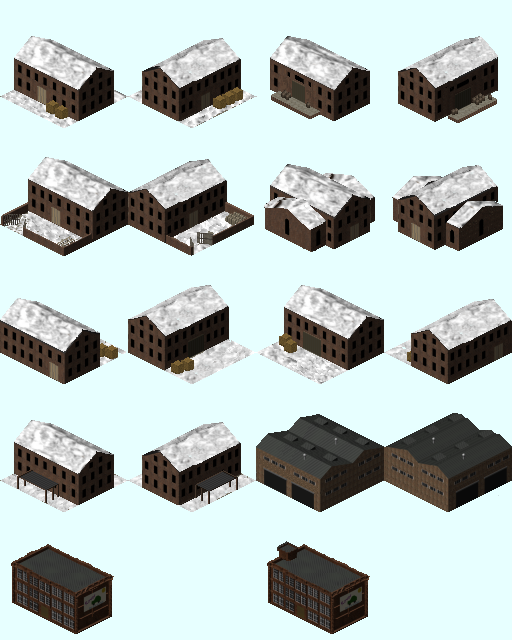 Using the images I created awhile back for a possible revamping of the older Mills, I have a .dat for these, with just two rotations for now (and no snow yet), ...not quite perfect, there are some alignment issues, but it's a start. Should I continue work on these? That's a splendid start - yes, do keep working on them. That is rather excellent, and would greatly help early heavy industry. I wonder, did they have glass roofs back then? Those squares on the roof look like glass roofs. They wouldn't have been glass - those panels are far bigger than they could make glass in those days. They look like wooden hatches. Incidentally, I am moving this thread to the Standard Pak128.Britain board, as this new industry is really equally applicable to Standard as to Experimental. Looks great. Did you get any further with other industry graphics? Looks like there won't be any changes to the code to allow more flexible use of your tiles idea, but we could still do with more new graphics for industries from different eras. The other industries I'd suggest from that era are military related. Armourment factories, ropeworks, all the sort of thing one needs to supply a navy that is ruling the world. If there would be industries that have to be adjacent to water, or have water tiles, a shipwright or wharf shipyard could be a nice industry. Consuming very large amounts of timber and textiles until 1890 then huge amounts of steel. Extension request? Military industries are not something I feel fit into simutrans. What's that quote about italy, war and the rennaisance, vs switzerland, peace, and the cuckoo clock? A ropeworks is not a uniquely military industry, however; but what would consume its outputs? Does one need a string of chandlers' shops? Perhaps rope could be sold at hardware shops in the mid 19th century onwards? I think that we should put the rope in a hardware shop as you said jamespetts, but we should also use the hardware store as an output for nails and other hardware like objects. oh, that was the reason i above suggested a new industry type to be built near water, to allow shipbuilders as consumer industry. I quite like the idea of shipwrights. 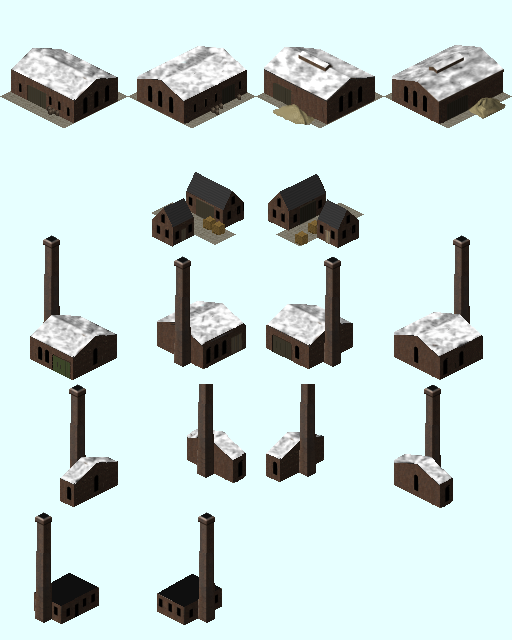 Since that uses my modular mills images, we could do several, somewhat overlapping-in-time, variations in size over the years... a 1750-1788 one-or-two tile version, a 1770-1820 four-tile version, and so on. There are no snow images, because I coded this only to be placed in temperate zones. The fishing-port is already an industry that must sit on the water... so a shipwright should be quite possible. Know any good period drawings? I've never seen those! So industries at the edge of water are already available in game. Yes, climates=water location=land should do the trick. The documentation here is a little outdated, suggesting that only works for attractions. But from this discussion it should work for any 1x1 industry as well... should we change the wiki accordingly? In theory I think it should work for any size building, as long as one corner is over water? I've never tried it. The idea with the shipwrights it very good idea. 2*1 and 3*1 should work as well, any linear shore could work. Or 1*1 with sheds coded as fields. a shipwright should be quite possible. Know any good period drawings? There must be oil paintings of that sort of thing. Portsmouth had Dry Dock(s) since 1495, so one of those might be in order? Do you have sources for that...? Shall look forward to trying it! Wlindley, didn't you some experiments with factory buildings coded as fields? How did that work out? Ironworks playable .pak, source, and .dat -- all for Experimental -- are here ... might need some mods for Standard. No snow images, as I have coded it only for temperate climates... which should be relatively prototypical. That includes the current Modular Mills images, both .png and Gimp .xcf layer files. Thank you for that - that is rather lovely. Two small things: could the railings be a little darker, perhaps a sort of charcoal colour? Also, would it be possible to have all four rotations rather than two? Thank you! Edit: With some modifications, I have added this to Github - but it would still be good to have the abovementioned graphical refinements. Thank you! THank you for the Data wlindley. Four rotations will have to wait until I redraw a few of the mills images. As for "railings" -- you mean the fence around the coal? It is currently approximately a 50% grey... I could make it more like #555 instead of #777. Would you like a 1x3 version for 1750 and a 2x3 for 1850? One of my main goals with the modular mills images, is that the larger later factories should cover a little more ground. Hmm - different sizes would interfere with the upgrading mechanism, so perhaps best leave that for now. But, yes, the fence could do with being a darker colour if you are able to do that. Thank you very much for this - it is most helpful. Edit: Incidentally, I think that we shall still need snow graphics, as people can set their winter snowline anywhere if they choose. I didn't realise larger buildings over time messed with the upgrading code - I actually thought that was the idea to get bigger industries over time. Certainly from a graphical perspective parger over time would be better. Anyway, regarding the current images, four rotations and snow would be necessary for pakset inclusion (standard at least). If you pursue the modular idea some more, can I recommend having as many of the tiles as possible so that they can work in all 4 rotations or at least just need (individually) two rotations? Indeed. In the mills*.png used here, I have already started moving tiles in preparation for 4 rotations... this week's project. Then on to adding snow. I hope also to write a Perl script that will take a Gimp .xcf and automatically turn on layer groups to automatically create individual .png files... once I update the .xcf, "make" ought to be able to compute all those pesky details! I haven't plotted out the automatic .blend -> .png creator yet, though. 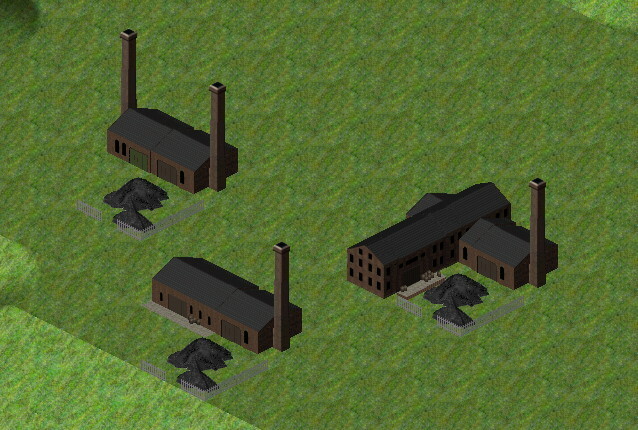 Earlier industries could be surrounded by yards, which would be taken over while upgrading the factory. That what you here be said it a very nice idea.